“I wanted to cut loose from the world, and I shared, too his desire to escape to the wild, a desire that can rip away all human softness and leave you stranded in a world of savage, courteous despair”.- Helen Macdonald on T.H. White’s need to train a goshawk. When her father passed away suddenly from a heart attack, Helen Macdonald was devastated. Some people may have retreated to far flung destinations to reflect and repair. Macdonald instead stayed in her Cambridge city home, and a trained falconer set her sights on a goshawk; a large and powerful hawk traditionally revered for its symbol of strength and one of the most difficult birds of prey to train. The falconry term “yarak,” refers to a state of bug-eyed, murderous intensity goshawks have been known to display. Locked away in a self-induced prison of sorts, Macdonald takes her newly purchased bird, Mabel, costing her $800 pounds sterling, and together they begin training. 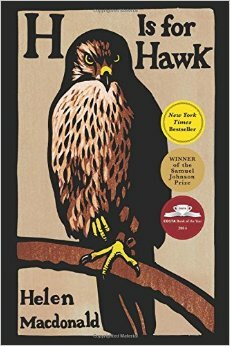 While in her home, she recounts her predecessor, T.H.White’s book, The Goshawk. She reads and re-reads the book. English author and amateur falconer, White also took a goshawk and attempted to train it. Macdonald, while reveling in his book- probably because of the limited books on the subject, did not share White’s view that hawks were monsters, or that falconry was a war. She did, however share his vision of goshawks as freedom; and his words that caused him to pursue the hawk- “because I am afraid of things, of being hurt, I have to attempt them”. Training this bird would be the ultimate challenge for Macdonald- taming a ferocious predator was her way of dealing with the grief she was going through. Macdonald’s book is told through the eyes of a naturalist, journalist and daughter. The book covers a wide range of topics from loss, grief, humor and hope. She details the book staunchly and does not mince words. In fact, her journalistic, natural history eye is evident throughout the book and serves her well. What I especially enjoyed in the book is the seamless way she intertwines these themes. Her knowledge of falconry is sound; her analysis of White is honest and the catharsis she undergoes throughout the process is a story you will not want to miss.